Four new food counters offer restaurant-style fare. Hot dogs, hamburgers and popcorn may be considered all-time classics when it comes to concessions fare, but hungry guests at the Spokane Arena now have plenty more to choose from. 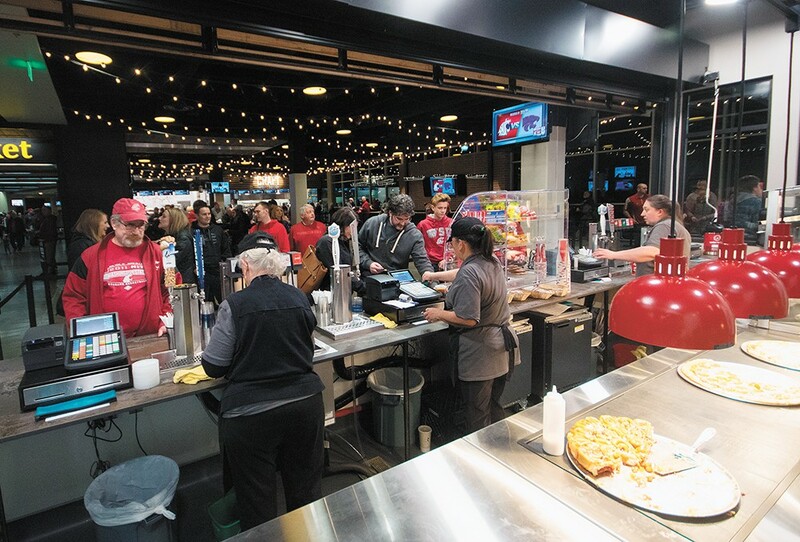 A remodeled and expanded concessions area called the Market, located on the northwest end of the arena concourse, debuted earlier this month with many new food options: gourmet-style sausages, Asian cuisine, artisan-style pizza and grilled sandwiches. Each of the aforementioned cuisines are served on concise menus at one of four new food counters inside the Market, which the venue's food service staff developed to be more comparable to casual restaurant dining than generic concessions fare. The Market also includes a 16-tap beer, cider and wine bar, although each of the four counters also feature four beer taps, along with soda and other non-alcoholic beverages. The four new stands were developed by locally based culinary staff of Centerplate, the national catering and food services company that services both the Arena and the Spokane Convention Center. At Griddled, Arena guests can choose from grilled sandwiches like the staff-favorite Cubano ($9.50), with pulled pork, ham, swiss cheese, honey dijon and dill pickles. There's also the "fancy pants grilled cheese" ($8) with three types of cheese, and a dessert sandwich of maple cream cheese and candied bacon served between cinnamon swirl bread ($7). "Our main customer base is [Spokane] Chiefs fans, and they are here a few days a week, so it's nice for them to get something different," explains Centerplate sous chef Jessica Reuthinger. Meanwhile, the new artisan pizza stand Crust serves up hot, fresh slices ($6-$7.50) of four styles: cheese, pepperoni, veggie and Italian sausage. Reuthinger's favorite creation there is the oven-fired cinnamon roll, served in pizza-like slices. Craft Burger and Sausage serves three different burgers, as well as a spicy andouille sausage and bratwurst ($6/dogs; $9-$10/burgers). Rounding out the list is Noodled, which serves three different wok-fried noodle wraps — banh mi, lo mein and phad thai — that can also be ordered as rice bowls ($9/each). Each of the four stands offer at least one vegetarian option, and a dessert. "We're trying to stay up with the times, and offer something new," says Centerplate executive chef Harold Froewiss. "Some of those [previous] stands were original when they built the Arena, it was time to move forward." Work to modernize the Spokane Arena's food offerings began earlier this year, and also included a street taco stand that opened several months ago; it's located on the southwest concourse. Previously existing food and beverage areas that remain include the Red Tail lounge, Dry Fly Distilling's bar and restaurant, the No-Li Taproom, Jameson Pub and a few other smaller popcorn and sweets stands. The Arena's culinary team designed all four menus to be flexible, so that new items and specials can be introduced to keep dining options fresh and interesting to venue patrons. They also focused on making prices competitive with other dining options in the vicinity, and the Spokane market overall. Another goal of the concession expansion is make ordering food and drinks a faster experience for customers. The original print version of this article was headlined "Event Eats"